Red Eye Cookies owner Brayden Pleasants wants to bring you milk and cookies — whatever time you get a craving. 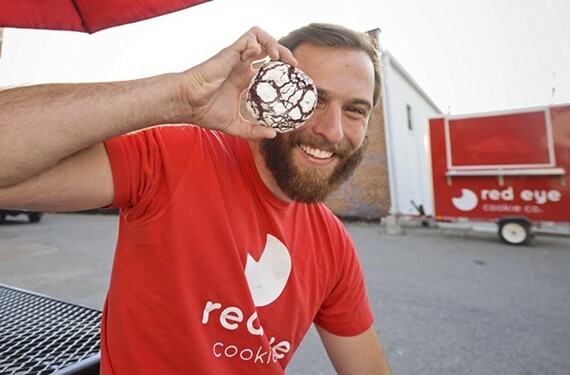 Red Eye Cookies was the first in Richmond to enter the late-night cookie-delivery market — who knew there ever would be such a thing? It’s a brilliant idea and we asked owner Brayden Pleasants about the business we wish had always been around. Style: Why did you decide to start a cookie delivery service? Pleasants: I think the company started for the simplest reasons: We wanted cookies delivered to our mouths in the middle of the night. Nobody was doing it, so we set out to. Did you wish you could have ordered cookies while in you were college? Our love for cookies was certainly present in, though not limited to college. When haven’t we wished we could order cookies? How many cookies do you sell a night, on average? We were blown away by the demand when we opened, and it hasn’t slacked off since. We try not to get too specific on numbers, but I think I’ve said before that we make around a thousand cookies a night. It can really range from a few hundred to a few thousand depending on what’s going on. What’s the oddest order you’ve ever gotten? I think what’s fun about a late-night cookie delivery is that it’s out of the ordinary. We’ve had orders from weddings and corporate events to legalization parties and late-night study sessions. We often get original requests for drawings or messages to add to the box — or even dances for our drivers to do. And what are some of the strangest things you or your delivery people have seen? When you’re open in a college town until 2 a.m. you see all manner of things. It’s not a boring job. Our drivers tell me they’ve been mistaken for taxis by drunken bar-goers or exotic dancers — we have a good-looking staff — and been offered to share in whatever festivities our customers happen to be enjoying. We just drop off the cookies with a smile and head back to the shop for another run.